Flavius Belisarius (Greek: Βελισάριος, c. 505 – 565) wis a general o the Byzantine Empire. He wis instrumental tae Emperor Justinian's ambeetious project o reconquerin much o the Mediterranean territory o the umwhile Wastren Roman Empire, which haed been lost less nor a century previously. 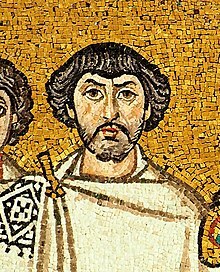 Ane o the defining featurs o Belisarius' career wis his success despite varyin levels o support frae Justinian. His name is frequently gien as ane o the sae-cried "Last o the Romans". This page wis last eeditit on 5 Apryle 2017, at 01:59.